Though some may dread the coming of Winter; with the Sun sinking low behind the horizon after shedding just a few precious hours of light and cold winds tearing away the last of the amber leaves clinging to the trees – it’s not all doom and gloom, especially if you’re a wildlife photographer (or even enjoy shooting landscapes!). I thoroughly embrace the change of seasons, and I encourage you to do the same. There are a huge number of benefits – if not only because you’re more likely to find the sort of peaceful, undisturbed seclusion many of us hope for when out with the camera! I’m going to share with you three of my top reasons you should love Winter as much as I do, and some great tips for photographing in our coldest season, to help you really make the most of this beautiful time of year. Many will see this as something rather gloomy and sure the long days of Summer have their own benefits, but if you’re one of the many who struggle to wake in-time to capture the Sunrise – this is the season for you! There are days in mid-winter when the Sun is still struggling to crest the horizon after 8am, which surely makes capturing a Winter Sunrise far more attainable when compared to the 3.30am starts necessary to capture daybreak during Summer. Admittedly, the earlier nightfall is perhaps less favourable – but maybe it will give us all a chance to catch up on that backlog of editing that we need to get through?! A lot of the species that you’ll be wanting to photograph also need to make the most of shorter days and those that aren’t in hibernation will be busy foraging and looking for food; trying to get as much into the shorter hours of the day as possible; which often increases your chances of finding your subject and getting the shots you’re after, and provided you’ve found a good location can also mean you get to watch a greater variety of species. 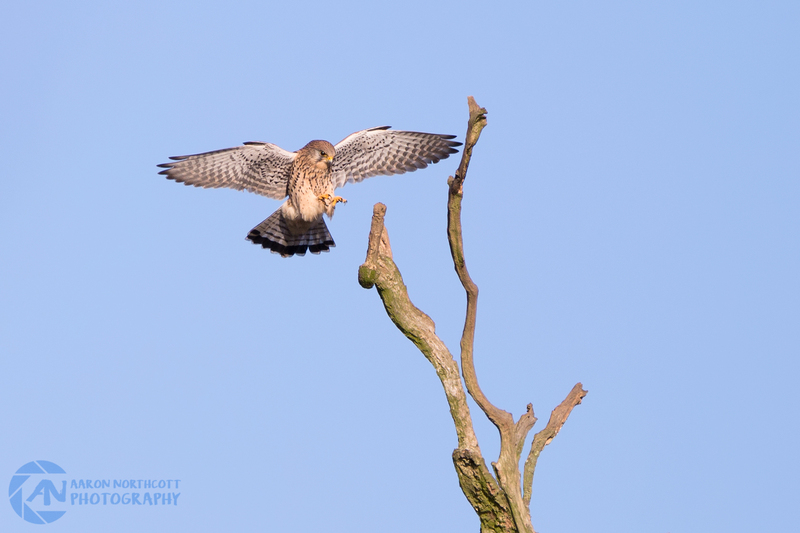 A Kestrel (Falco tinnunculus) comes in to land on the top of a dead tree overlooking the fields below. Bright sunny Summer days can often make a wildlife photographers task a lot more difficult; having to deal with lots of contrast, blown-out highlights and harsh shadows. The perfect time to shoot during these days is just after Sunrise and just before Sunset because the light takes on a softer feel and allows beautifully balanced exposures with a warm, atmospheric quality to the images . . .
Lucky for us, during Winter this is often the sort of light you’ll encounter ALL day long! So sure, the days may be shorter this time of year, but it could also mean that you actually have more time to get the shot you’re after! 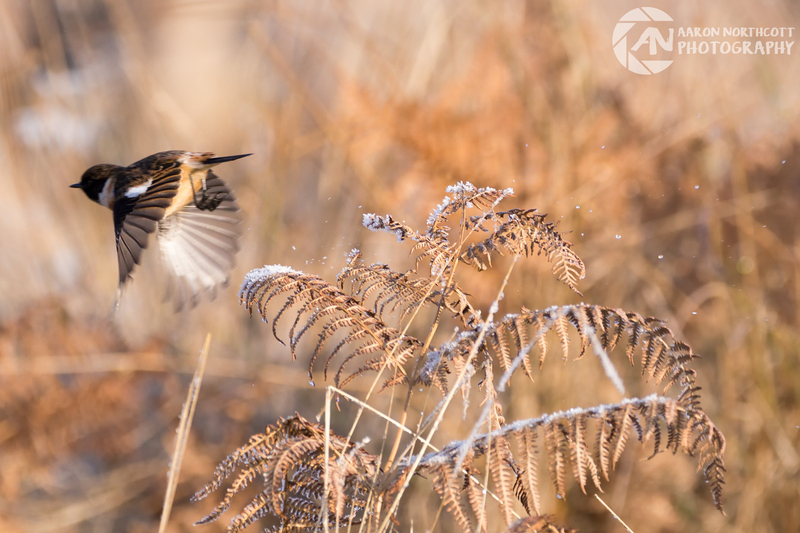 A Stonechat (Saxicola torquata) flys past in a flurry of frost and feathers. “There’s no such thing as bad weather, just bad clothing” – something I remember being taught as a young boy, and certainly a saying that has stuck with me. There’s of course a lot more to it than that (good clothing, good equipment, good preparation, etc) but the premise is simple enough. During Winter there are days when the weather will be against you and light will be the least of your concerns; snow is seemingly less and less inclined to fall in the UK as each year passes, but that doesn’t stop the icy winds, hail stones and freezing rain. Far from opting for a seat by the fire when a day like this arrives – I embrace the opportunity to capture unique and exciting shots of species coping with the elements in Nature. I encourage you to do the same – grab a good pair of walking boots or wellies, a warm weatherproof jacket, a waterproof cover your camera (even just a plastic bag can be enough!) and get out amongst the elements to capture something new and exciting. 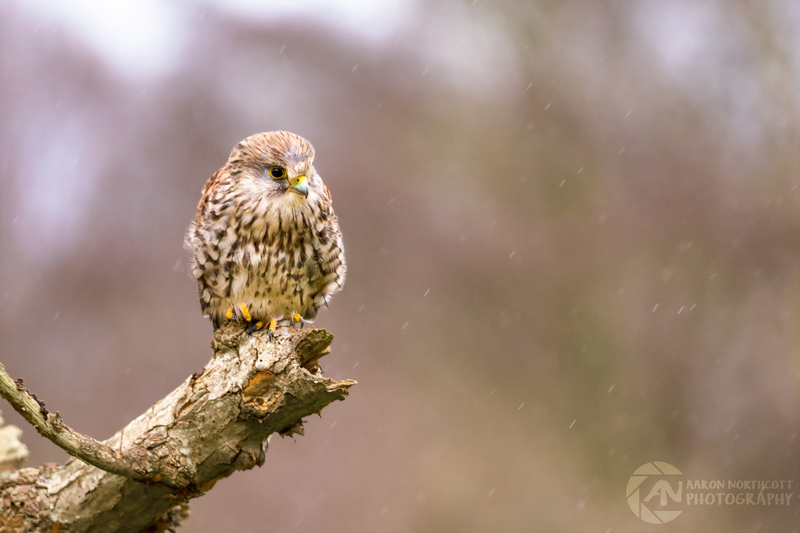 A Kestrel perched on the remains of an old conifer tree in the rain – photographed in the Fingrinhoe Wick nature reserve. Before you set out, take a look at some of my tips for really getting the most out your time spent photographing wildlife in Winter . . . 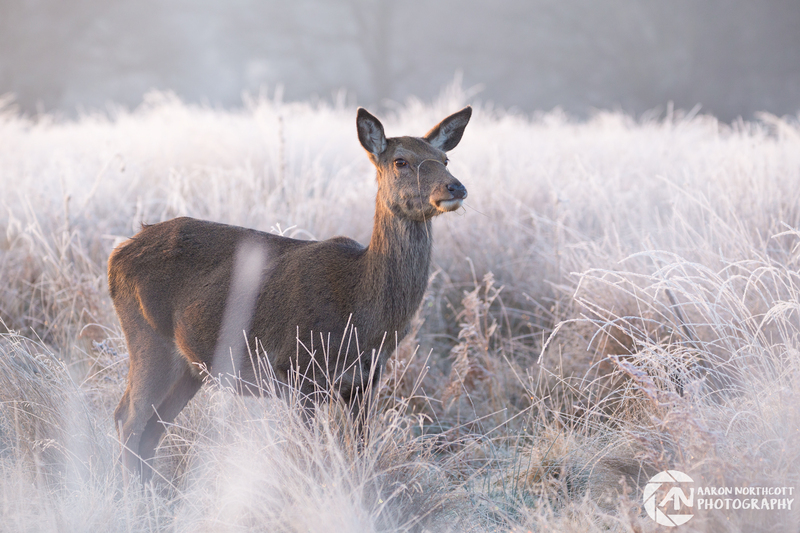 It is extremely important to make sure you’re properly prepared to venture out and photograph wildlife in Winter, because not only do you need to change the way you shoot – but you also need to consider the safety of your equipment and yourself! – Check and charge all of your equipment and prepare it ready for your expedition the night before. – Take a look at the weather forecast before setting-off and wear appropriate clothing. – Scout ideal locations during warmer months so that you don’t have to waste precious daylight hours looking for a good place to set up. Extreme weather conditions can put high demand on your equipment (and you) so ensure you’re optimising your kit list in preparation. – Pack extra batteries, as the cold weather can deplete their energy reserves significantly faster at low temperatures. – Consider using a portable hide to protect you from the weather and provide a little extra warmth.The first time I used a portable hide it was in Swedish Forests many years ago and it has been an essential part of my kit list ever since! 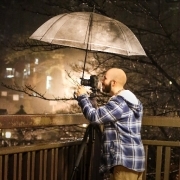 – Look for a tripod like the Manfrotto 190 which offers some protection for your hands in cold weather – designed with rubber grips on the legs, so that you don’t have to handle cold metal or carbon fibre in icy cold conditions. Winter weather affords new challenges for Winter photographers, offering the opportunity for fantastic and memorable shots – provided you’re ready to shoot them! – Branches will be bare and foliage can be sparse during Winter months which can result in messy and distracting environments for Wildlife photography; so try to find new angles for your images that allow your subject to stand out against a clean backdrop of snow, sky or bokeh’d landscapes. – Shoot in Manual and regularly take test shots. The lovely low light can be unfamiliar and if snow has fallen then extra light is often reflected – making for tricky (but rewarding) lighting conditions. – Light will begin to fade earlier than usual during Winter and it’s always worth bearing this in mind when considering ISO levels for your images. High shutter speeds are nearly always essential for sharp images when photographing wildlife, meaning you may need to alter your ISO levels to compensate for faltering light later in the day. 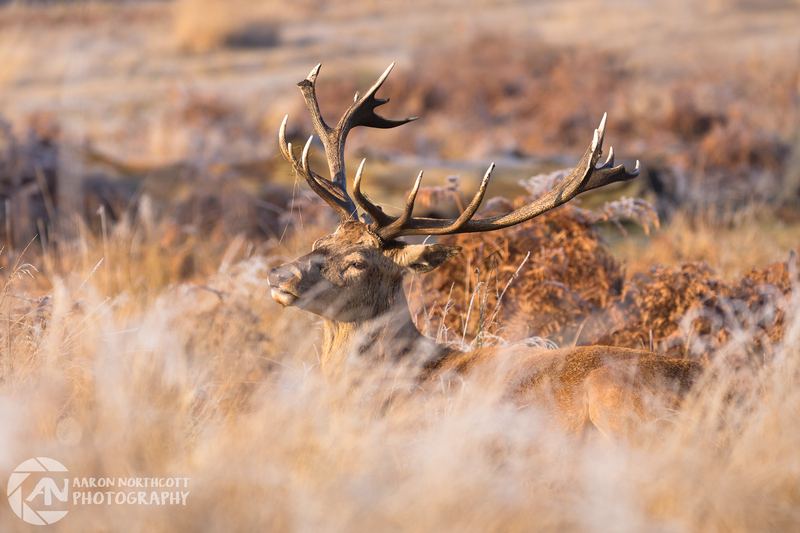 An imposing Stag (Red Deer) rests as the sun rises above the horizon and brings colour to the frost covered undergrowth. Hopefully reading this article and seeing some of my images you’ll have been inspired to venture out on your own and capture some truly wonderful wildlife photography, but most importantly have fun and don’t forget to throw the odd snowball!